The fun of collecting world coins, from Portland Coins. The winning designs for Andorra's new euro coins. Andorra is a small country (a microstate) with a population of around 85,000 located in Europe between France and Spain. Andorra is about half the size of Rhode Island, the smallest US state, to give you an idea of how small it is. Being so small, Andorra does not have its own currency. Before the year 2000, both the Spanish (peseta) and French (franc) currencies were used for transactions within Andorra. In 2000 both Spain and France switched to the euro, and Andorra similarly changed its legal tender. In 2011, Andorra requested, and eventually received, approval from the European Union to issue its own country-specific Euro coins. The resulting agreement between the EU and Andorra authorizes Andorra to mint and distribute coins with a face value of up to 2.5 million euros annually. In early 2013, the Andorran government held a contest for the designs of the new coins (except for the 2-euro coin, which would display the Andorran coat-of-arms), and the results were announced in May. The 1, 2, and 5 euro cent coins will feature the image of a Pyrenean chamois (a goat-like animal native to the area); the 10, 20, and 50 euro cent coins depict the fresco of Christ in Majesty at Sant Marti de la Cortinada; and the 1 euro coin will display an image of the former Andorran Parliament building - the Valley House. The new coins are expected to be available starting in January of 2014. For foreign coin collectors, what is exciting is that we get new euro coins without replacing an existing currency. Most European countries, when they switch to the euro, must leave their old money behind - so while the collecting world gets a new euro to collect, the country's former coins are taken out of circulation. Since Andorra doesn't have its own currency (though it did occasionally issue coins), we don't have to say good-bye to any existing coins. 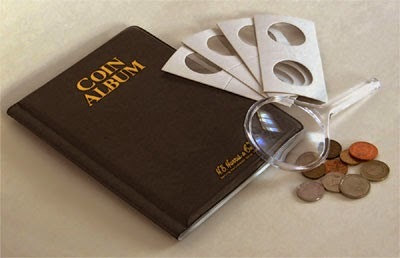 World coin collecting kits and exclusive coin packs. Copyright 2011 Portland Coins. Simple theme. Powered by Blogger.